To build a quality engine, you must start out with a good case. After disassembling the engine the case is washed, inspected, align bored main and cam, and case saved if needed. Thoroughly clean again, then install original main and rod bearings onto a reground or polished crank with a German gear set. Install an inspected set of rods, cam bearings and a good cam. Install a set of matched reground lifters. We use EMPI chrome sump plates on our 1776 and larger engines. Fit it with a new sump screen and gaskets. Install a surfaced machined pump and cover. After all the head studs have been installed, check the deck height and c.c. both heads. Then setup a compression ratio that will run on regular unleaded gas 7.5:1. Clean the new pistons and cylinders, of any Cosmoline and apply oil before assembly. Install the pistons and cylinders, deflector tins and heads before the sealant dries, with new pushrod tubes and red silicone seals. The heads have been thoroughly cleaned inspected for cracks and sunken seats. Then run through our Shot Peen machine for superior cleaning. fly-cut and matched to be identical. After the heads have been installed pressure check the heads on the engine to make sure there are no leaks. during start-up they do not run dry. Install valve covers and re-bend the bails so they will have the same strength as they did when they were new. best starting point for the top end to be assembled. to the price of the engine. 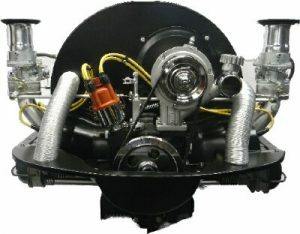 All of our complete engines have all New parts, unless otherwise specified. Original Bosch is no longer manufacturing spark plug wires for the air cooled engines. So our replacement for this will be EMPI. The colors that we offer will be blue, red or yellow. If none are specified then we’ll install blue. If you have any questions, Call us or email us. Installation of complete engines with dual carbs., installed from $480.00. Exchange is for long block only. Every complete engine is started and ran for 20-30 minutes. 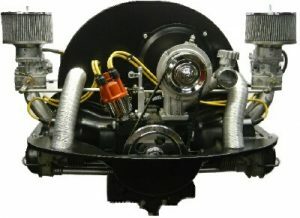 We check oil pressure, timing and carburetor adjustment. linkage and heim joint style ends. water repellent, black color only.